McGraw-Hill Construction, part of The McGraw-Hill Companies, has released its 2011 Construction Outlook, which predicts an increase in overall U.S. construction starts for next year. The level of construction starts in 2011 is expected to advance 8 percent to $445.5 billion, following the 2 percent decline predicted for 2010. Rev. William Kaina blessed the new micro tunnel-boring machine during the christening ceremony in Honolulu, HI. He is standing with Patricia Coluccio next to one of the CCFRPM pipes. On Aug. 17, 1999, a powerful earthquake hit Turkey’s Marmara region, destroying the city of Istanbul, causing more than 17,000 deaths and 40,000 injuries. In the wake of this region’s disaster, there are predictions of another large earthquake occurring in Istanbul in the near future. UCT's second day came through with talked-about educational sessions and busy aisles. But perhaps the highlight of the day for most was a lively evening starting at the UCT Networking Reception, where exhibitors, speakers and attendees were invited to enjoy free drinks and appetizers. Exclusive pictures and the show daily for Thursday available inside. Here's the latest from the UCT International Conference and Exhibition going on now at the George R. Brown Convention Center in Houston, TX. What are you missing? Yesterday, trenchless industry association UCTA bestowed its annual Most Valuable Professional Award on CIGMAT's Dr. Cumaraswamy Vipulanadan, Ph.D. Barbco unveiled a much-requested disc cutter, debuting at UCT after over a decade's wait for a commercial offering. UCT's first ever SafeZone started offering attendees a shot at locating a tricky line on-site, while the Rehab Zone showed off with live demonstrations of three separate technologies. Watch the PipeLine Machinery-distributed DECKHAND pipe handling system lift, tilt and twirl line pipe. Video from Jan. Underground Construction's Traci Read interviews LaValley Industries president Jason LaValley, Jan. 13 2011. Roger Kirwan, vice president of marketing for Vacmasters, Denver, CO, has retired after working 17 years with the company. Considered by many to be an expert in air-vacuum excavation, Kirwan spent his career at Vacmasters advising the community in the best practices when considering excavation work where underground utilities are present. HammerHead Trenchless Equipment of Oconomowoc, WI, announced the addition of Ryan Boldan to its sales team and Paul Rogers as global accounts manager. The Federal Energy Regulatory Commission (FERC) is investigating the possibility that two interstate pipelines are charging unreasonable rates. The FERC opened mid-November investigations of Kinder Morgan Interstate Gas Transmission LLC and Ozark Gas Transmission LLC, a unit of Spectra Energy Partners LP., based on reviews of Form 2 cost of service and revenue information submitted by the two companies for 2008 and 2009. Since its inception, a primary responsibility of the Pipe Line Contractors Association (PLCA) has been to negotiate collective bargaining agreements with the four international unions with pipeline jurisdiction--the Teamsters, United Association, Operating Engineers and Laborers. New Technology Saves a Sewer Interceptor—and $1.5 Million! The city of Westlake, OH, got an interesting wake-up call in 2006 when a sanitary sewer interceptor line in the nearby city of Lorain failed dramatically. “It forced the evacuation of several dozen homes for months,” says Westlake Director of Engineering Robert P. Kelly, P.E. On Jan. 13, PipeLine Machinery International (PLM), the first Caterpillar dealership without geographic borders, held a grand opening of the company’s new equipment yard and a working demonstration of the DECKHAND Pipe Handling System, exclusively distributed by PLM. 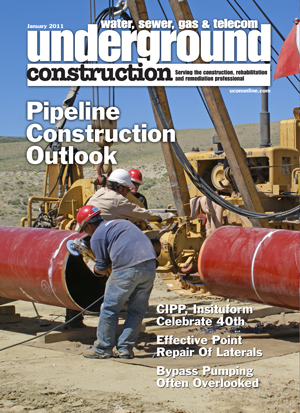 While oil and gas transmission pipeline construction has slowed compared to 2008, projections from two different studies still predict a solid market for the next few years and continued growth in natural gas and consumption through 2030. For more than 30 years, video inspection has been a fundamental analytical tool for the evaluation and assessment of pipeline integrity. Originally developed as an aid for sewer system maintenance, video inspection equipment has played a key role in the development of a variety of trenchless rehabilitation methods. Rehabilitating sanitary sewer laterals was the subject of a recent series of articles that focused on legal issues regarding ownership of laterals and the emergence of trenchless methods for lateral rehabilitation. However, another key element in dealing with laterals involves point repairs that effectively address inflow and infiltration (I&I) problems that are structurally sound and do not require rehabilitation. This year the cured-in-place pipe rehabilitation process and Insituform Technologies, the company that created it, celebrate a significant milestone: Insituform’s 40th birthday and the anniversary of the completion of the first commercial CIPP project, a 12-inch sewer. For the first time in decades, Irv Gemora doesn’t have a “regular” job to go to each day. After retiring as executive director of NASSCO (National Association of Sewer Service Companies) last August, Gemora helped with the transition of the association’s new executive director, Ted DeBoda, and he remains on the payroll as a consultant until February. Ted DeBoda took over as executive director of NASSCO (National Association of Sewer Service Companies) in August 2010 and has settled in quickly, managing on-going association programs and looking ahead to the challenges of the future. Addressing the problems of the nation’s aging underground infrastructure is a priority for many cities and sanitary sewer and water districts across North America. Though slowed by the economy, there is still a host of massive rehabilitation and construction projects under way or in planning stages with many more such efforts to come. Case Construction Equipment introduced Jan. 18 three new F Series wheel loader models. The new machines provide faster acceleration, quicker cycle times and higher travel speeds while delivering as much as 17% greater fuel efficiency. Root control products from Duke's Root Control, RootX and Vaporooter. The latest in grouting technology and equipment from Logiball, Avanti, CETCO, Aries Industries, Prime Resins, Parson Environmental, de neef Construction Chemicals and CUES. The VER-T-POL, a product of Oklahoma Design Technologies, is used to support poles for trenching or excavation during utility work, such as replacing water lines and sewer lines. Akkerman Inc. recently unveiled the 1548 Haul Unit featuring enhanced operator safety and comfort combined with improved productivity for spoil removal starting with Akkerman’s 600 TBM up to their BS 1440 excavator shield. <strong>The AMRAK Adjustable Meter Riser Assembly Kit</strong> The three-piece PVC adjustable meter riser assembly kit (AMRAK) includes a double kick 24-inch radius bend, riser and expansion cylinder with adapter, clamp and screws.